The Collegiate Shag is a form of swing dancing, which has some visual similarity with balboa (another swing dance), but with different footwork. Danced with a lead and follow, it is now danced to primarily upper tempo jazz music (usually 200+ beats per minute) while historically it was danced to a variety of tempos but primarily mid-tempos. It is danced in a closed position dance hold (similar to those used in ballroom dances). Three forms of “Collegiate Shag” danced in the early thirties were termed single, double, and triple Shag. The variety names describe the amount of slow (step, hop) steps performed in the execution of a basic. These slow rhythmic steps were always accompanied by a single quick, quick rhythm. “Collegiate” shag evolved from Shag a dance with no clear historical record, but assumed to be the based on early Foxtrot. The term “Shag” however is known to have been used as a slang term to describe early Vaudeville performers. The name association is presumed to relate to the lively performance nature of the dance. The differences in rhythm most likely were due to lack of standardization of Foxtrot basics at the time and the prevalence of regional styling. It was named “Collegiate” Shag most likely as a marketing ploy as many “Collegiate” dances were being created at the time for marketed towards the young (“college age”) dancers. 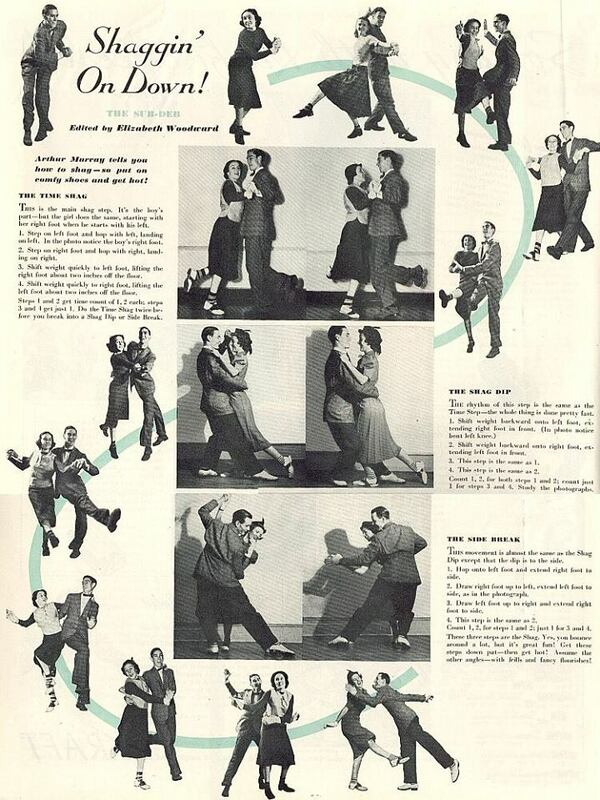 These “Collegiate” dances were leaping/hopping versions of their early ballroom counterparts. The name was derived from the way college youth would liven up the dances of old. These forms are known to pre-date the lindy hop and balboa. Other breeds of Shag were later created such as Carolina shag and St. Louis shag. These other forms only share its name “Shag” not technique or imagery. This is again, most likely, due to its slang association with performance dances.